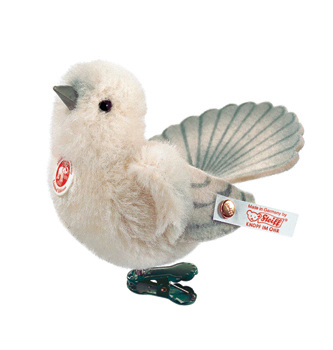 Steiff Alpaca Dove Discounts Apply ! This beautiful little dove will perch perfectly on the branch of a Christmas tree! He is limited to 2008 pieces worldwide, features a gold-plated Button in Ear and comes in a presentation box. This piece is part of Steiff's 2008 Autumn / Christmas range.